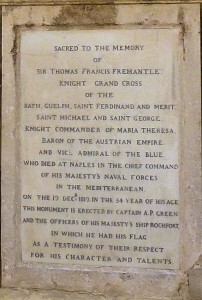 The Battle of Trafalgar, 1805 and Captain Fremantle. During the engagement at Trafalgar (just outside the Mediterranean, off the Atlantic coast of Spain), on 21 October 1805, the Royal Navy had one of its greatest victories for over 200 years, but lost Admiral Nelson in the process. Captain Thomas Fremantle was assigned the massive 98-gun HMS Neptune in May 1805 and was attached to the Cadiz blockade, off Spain. 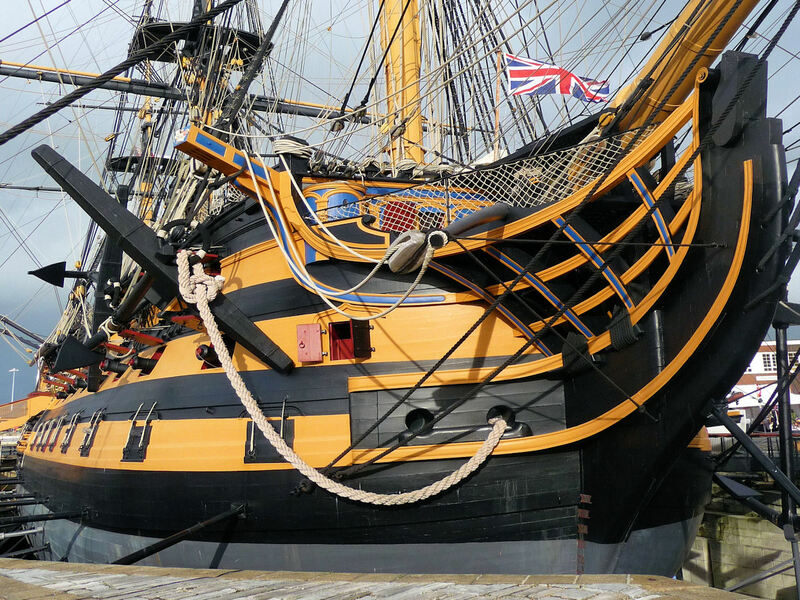 At the battle on 21st October, after Nelson’s ship HMS Victory at the front, HMS Neptune took its place 3rd in line behind Nelson’s Victory and the Temeraire as they sailed into action though fell further back. Following unconventional tactics devised by Nelson the line of British ships cut through the Combined French and Spanish Fleets shortly after HMS Victory did. 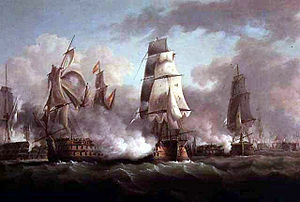 Forcing its way past the wrecked enermy ship Bucantaurre, Fremantle engaged the Santissima Trinidad with which he endured a savage slogging match, leaving the Neptune with 44 casualties but the Spanish ship had over 300. 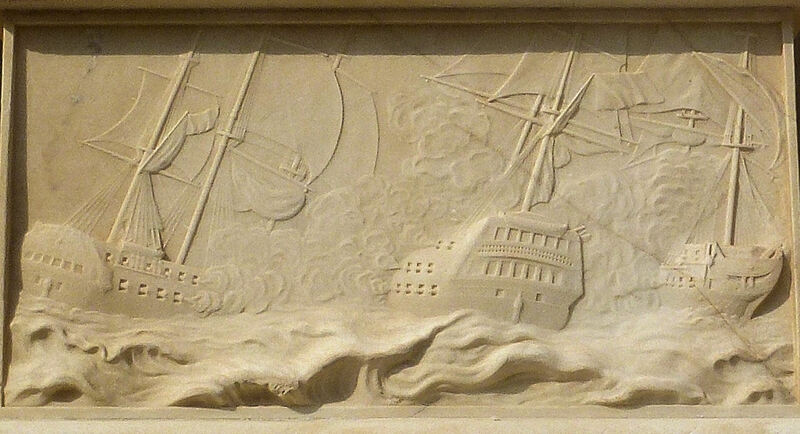 Relatively undamaged, the Neptune is likely to be the ship that towed the shattered Victory back to Gibraltar. Here the body of Nelson was preserved in a barrel filled with brandy, replaced by rum as a preservative at Gibraltar before being returned to Britain (National Archives). Captain Fremantle profited by taking the chapel silver from the big Spanish ship which he used to decorate his home in Swanbourne. Most of the other casualties from the battle were buried in Gibraltar, where the British ships had put in to port immediately after the barrel was over. 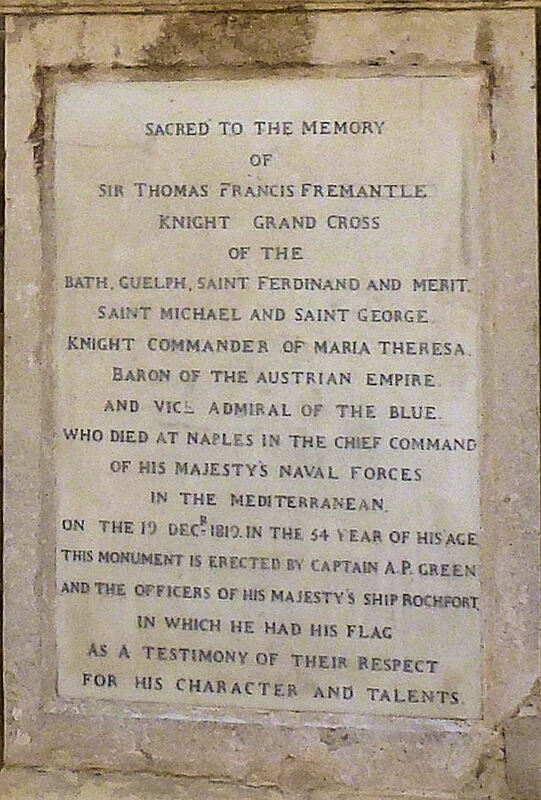 Photographs of monuments in Gibraltar and Malta relating to engagements in the Mediterranean and at Trafalgar. 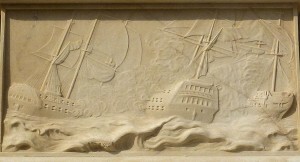 HMS Neptune commanded by Captain Fremantle in battle (centre) recorded in a painting. Admiral Collingwood’s message; photograph from an inscription in the Gibraltar Trafalgar Cemetery. Photograph of a grave in the Trafalgar cemetery, Gibraltar. FOOTNOTE: Successive articles and letters over about three weeks during October, 2013 in The Sunday Telegraph suggest that at Trafalgar, the British had a superiority in the construction of naval vessels – the English oak was more durable than the main wood used to build the newer French ships which (at Napoleon’s insistence) were made of Corsican pine – which more readily splintered in battle. Also, the undersides of many British vessels had copper plates screwed over the wood that discouraged barnacles, and made them slip through the water more readily, aiding speed and manoeuvrability.